A Doctor, a Dietitian, or a Health Coach. . . Which Do I Hire? So, you have a particular health challenge that’s having an impact on your life. So, you visit the doctor. Depending on what type of doctor you visit, depends on the diagnosis you might receive and the treatment you receive. Now let me ask you, what has changed, say, 8 weeks later? Are there any marked improvements in your symptoms or condition that is having a positive impact on your life? Did you get addressed what you originally went to the doctor for? Many people I speak to are still dealing with a great deal of their symptoms even after visiting the best caring doctors and receiving, what they though were the answers they were looking for. So, with determination, you proceed on with finding help. You’re smart (have I told you that, lately?). Therefore, you know that food is a very important part of you reaching better health so that you can get back to living your life. You decide to hire a dietitian. They discuss with you the percentage of macro’s you need to have (protein, fat, and carbohydrates) and give you a daily calorie target based off your weight, height, and weight goals. They have you increase your lean protein and urge you to cut down on all sugars including processed sugars and fruit. You feel good about these changes because you feel like the Dietitian really heard you and understood you. Maybe you actually have more energy the first few months or even a year. And maybe even some of your symptoms subside. But then, a year later, you are starting to put on more weight and the migraines, insomnia, or other symptoms are coming back— with a vengence. You decide to visit the doctor again. You walk away with another diagnosis, possibly something thyroid related, or maybe even a Lyme diagnosis, or a positive bill of health. They’ve put you on meds (or more if you were already on some before this). And you still don’t sleep well. You haven’t lost weight. Your symptoms are still affecting your daily life. As well intentioned and caring as these practitioners were, you still haven’t gotten your life back to where you wanted it to be when you originally seeked help in the first place. It’s time to add to your team of healers. How a Health Coach can help in this situation. Health coaches work with you on (normally) a weekly basis and spend anywhere from 30 minutes to 60 minutes (sometimes more) with you. We get to know you, where you are and where you want to be with your health— and your life. We work with you on how to implement difficult changes in your life that YOU are ready to make. Most importatnly, health coaches got into the field because we have experienced some type of health challenge that deeply affected our life AND HAVE FIGURED OUT HOW TO BEAT IT. (Read my story here). Our motivation is simply to help people with a particular health issue. . . and that issue that we had/have became our specialty. There are thyroid coaches, and eating disorder coaches, integrative medicine coaches, and hundreds more. I recommend seeking out the health coach that has experienced what you are experiencing now. 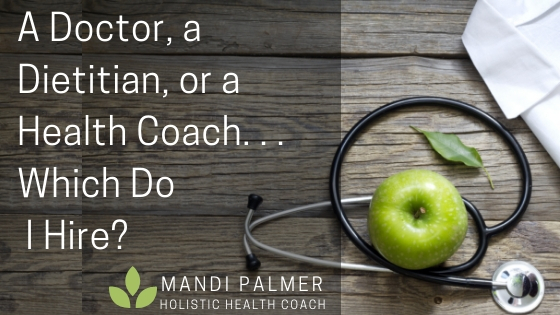 What is a health coach trained in? One, we’re trained in food and healthy living. Two, we’re trained in the art of coaching which helps the client to arrive at the best decisions for their own health and to guide them along. Coaches do not TELL their clients what they need to do. We ask questions that help the client make decisions for themselves. And because we have a specialty, we guide the client along in our specialty (mine are chronic illnesses, plant-based eating, and Anthony William’s protocols). We don’t diagnose. We don’t dictate your health (you are your own best health expert). We don’t prescribe. We provide guidance, coaching, support, info, and resources that help you actually get results in your life. Holistic Health Coaches (like myself) will help you look at all the areas of your life that could be affecting your health, not just food. We are there with you every step of the way in ways that doctors usually are not. So, Who Should You Hire? So when wondering which one to hire, it’s often a good idea to visit a caring doctor to rule out life threatening conditions. When it comes to weight loss, I think dietitians are wonderful for that. But, when you continue to have chronic migraines, persisting insomnia, continued bloating and indigestion, etc. what you need is side by side support in your journey to finding vibrant health. A health coach will be with you every step of the way. We’re a shoulder to cry on when illness takes you down. We work with you weekly to troubleshoot where changes need to be made and then we work with you on HOW those changes fit into your life. We have tools to help you find answers- and if we don’t have the answers, we’ll help you find them. Having a team of health professionals that include physicians, coaches, bodyworkers, and maybe even an intuitve is a smart approach to take on your health. It’s not that one is better than the other- it’s that we all have different roles we take on in your health journey and many times that is what is missing for people suffering with chronic health challenges. Not that they don’t need their doctor or dietitian, it’s that they need to ADD a modality to their team of healers. Interested in learning about working with me? I do a free 20 minute consult to see what working with me would look like for you. Click below to visit my online scheduler for easy scheduling.